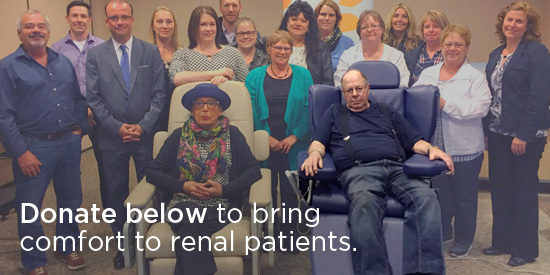 Why am I fundraising for renal chairs? My mother Francine was a renal patient in the last year of her life and passed away in 2014. Her dialysis treatment consisted of being at the Hospital for four hours a day, three times a week and would often be a painful process for her. One of the last conversations we had, she told me how uncomfortable the treatment chairs were and that, if she had the means, she would replace them all. Her words resonated with me and I committed to making her last wish come true. The Greek Supper Club event began in 2016 in support of the Renal Department with monies being put toward the upgrade of all dialysis chairs. Our first model was purchased with funds raised and introduced into service in May of 2017. It is fully ergonomic, allowing for the individual adjustment of arms, back and legs by use of a remote control. It will greatly improve the comfort of patients as they receive dialysis. Having been involved in my mother’s care for several years, I understand how important this change will be for patients. My mother would be pleased to know that her words inspired not only me, but a community to support this cause and create positive changes for others.